Status: [Least Concern] Widespread and fairly common in lowlands and valleys to about 1500 metres. Found along rivers and streams, as well as lakes, lagoons, and large ponds. 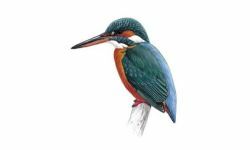 Description: Largest kingfisher in western hemisphere. 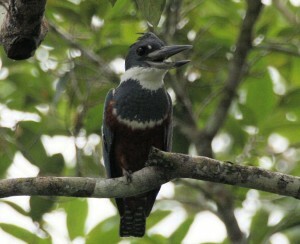 One of two kingfishers with blue-gray backs. 40–41 cm long, with deep blue or bluish-gray plumage with white markings, a shaggy crest and a broad white collar around the neck. Its most distinguishing characteristic is the entire rufous belly, which also covers the entire breast of the male. Females are more colorful than the male (i.e., reverse sexual dimorphism) and have a bluish-gray breast and a narrow white stripe separating the breast from the belly. Males have rufous chests and bellies. Females have a blue-gray chest band above a rufous belly. Habits: It is often seen perched prominently on trees, posts, or other suitable "watchpoints" close to water before plunging in head first after its fish prey. The breeding habitat is areas near large bodies of water, usually in heavily wooded areas where it finds a perch to hunt from. It is mostly a sedentary species, remaining in territories all year long. Both parents excavate the tunnel, incubate the eggs and feed the young. Similar species: Belted Kingfisher is smaller, has less rufous below and on chest. Gehlbach, F. R., Dillon, D. O., Harrell, H. L., Kennedy, S. E., & Wilson, K. R. (1976). Avifauna of the Rio Corona, Tamaulipas, Mexico: Northeastern limit of the tropics. The Auk, 93(1), 53-65.